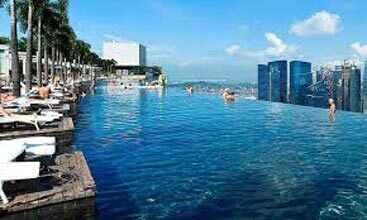 Accommodation in city center Singapore. 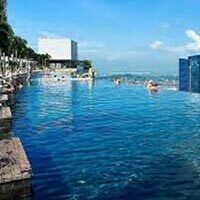 All major sightseeing tours in Singapore. Stay on the cruise with entertainment and all meals on board. Freedom of having relaxation and having a variety of entertainment on board the cruise. After breakfast in your hotel, we will take you to Singapore city tour which includes photo stop at the landmark of Singapore – Merlion followed by drive through the shopping district of Orchard Road, Cultural hubs of Little India and China Town, etc. We will also pass by the administrative district, Cricket Club, Supreme Court and City Hall, etc. Pass the Suntec Mall and see the fountain of Wealth, proceed to the chocolate gallery and shop the best chocolates of Singapore. Later we will take you to the amazing world of Sentosa Island, the most famous theme park of South East Asia. Board the cable car from Mount Faber and enter Sentosa in style. Visit Underwater World, Dolphin Lagoon, Tiger Sky Tower, Luge and Sky ride, Butterfly Park, etc. End your tour with Wings of Time show an awesome display of water, laser and fire effects, set to the majestic music and stunning scenes. Overnight at your hotel in Singapore. After breakfast, morning is free for you to relax in your hotel or you can go for various other attractions in Singapore like Jurong Bird Park, Singapore Zoo, Singapore Botanical Gardens, Singapore Science Centre orgo for a ride on Singapore Flyer. Later in the evening, we will take you to Night Safari Singapore to see the various animals living in their natural habitat during the night. Board the tram and your guide will share the facts and real stories about the place and fauna there. You can also take the different walking trails to explore more in there. Do not miss the Creatures of the Night Show and observe the unique behavior and amazing skills of the animals. You can also have your dinner here in many good restaurants,which serves almost all types of international cuisines. Overnight accommodation at your hotel in Singapore. Today after breakfast, we will take you to the amazing world of Universal Studios on Resort World Sentosa. This full day tour is areal fun for the whole family. Many world famous cartoon characters and superheroes of your favorite blockbusters will meet you here like Transformers,The Shrek, team of Madagascar, etc. in the form of a ride or an attraction. The Resort World Sentosa also offer great accommodation choices if you wish to spend one night there. You can try your luck in the Casino or can go for thrilling water slides. There are so many activities to do with lots of entertainment and fun for the whole family inhere, options are unlimited so making a selection is a tuff task for everyone. Overnight accommodation in Singapore hotel. Morning breakfast in the hotel, later check out and proceed to the Singapore cruise terminal to board your cruise, home for the next two nights. On board the ship you will get unlimited entertainment fun for the whole family – shows, parties, activities for the kids and families. In the evening watch the live shows or try your luck in the casino. All meals are included on board so you can try different variety of international cuisines every time you dine. Overnight on board the cruise. Breakfast on board the cruise. Later you can try some indoor games or relax at the swimming pool or Jacuzzi. Library is at disposal for people interested in reading. Evening gets active with live music and karaoke session. Watch the live entertainment shows, go crazy at the disco and dance like no one is watching you! Lunch and dinner on board the cruise and try casino tonight with some luck. Overnight accommodation on board. Today after breakfast relax on the cruise, later on arrival at the cruise terminal disembark your cruise and we will transfer you to the airport to catch your flight back home. Come back with happy memories of your Singapore and cruise vacation with Plan Journeys.